Sam Houston, the hero of Texas independence, routed Mexican General Santa Ana at San Jacinto in 1836 and declared Texas an independent country. ■ He become the first president of the state of Texas and served in that capacity for two terms during the years 1836-38 and 1841-44. ■ Houston's great-grandparents migrated from the Scottish village of Houston by way of Ulster about 1730. He was born March 2, 1793 in Virginia. At age 15 he was a frontiersman in Tennessee where he lived with Cherokee Indians for three years. ■ He fought under Andrew Jackson, became a congressman, and later governor of Tennessee. Angry at the conniving of government agents at the expense of Cherokees, Houston fought them vigorously in official circles. He became a lawyer and was sent to Texas to negotiate treaties with the Indians. ■ He decided to stay in Texas and became involved in the troubles brewing between the Anglo-Saxon settlers and the Latin regimentation of the Mexican government. War soon broke out and he became a prominent military leader. 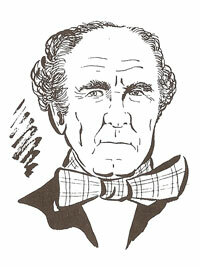 ■ When Texas was admitted to the Union as a state, Sam Houston became one of the state's U. S. Senators. He served as senator until 1859. He spoke out frequently on behalf of the Indians. This did not endear him with the Texas legislature, and he was not re-elected. ■ Returning to Texas, Houston again ran for governor and was elected in 1859. With the Civil War about to break out, he tried unsuccessfully to stop the succession of Texas from the union. ■ Upon his refusal to swear allegiance to the Confederacy in 1861, he was deposed as governor. He died on his farm near Huntsville, Texas, July 26, 1863.